Unless you are an elite runner, or someone who covers 70 training miles a week, 12 miles is a long distance to run. It's 92% of a half marathon and it felt very much like a full marathon this morning. I know a good number of people who run marathons and half marathons, and I am privately amazed by their confident view of these races. 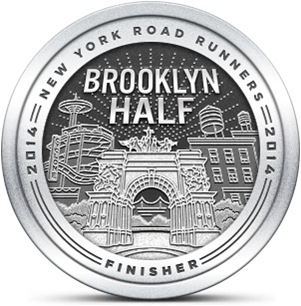 To me, a half marathon is an "Event" that takes many weeks of tough training and still guarantees to beat me to a pulp. My friends certainly give their training its due, but they don't seem as intimidated by the challenge. 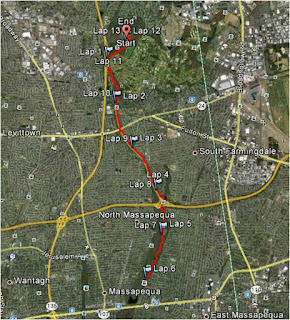 It was a chilly 34 degrees when I started this morning's run at Bethpage and I decided to start with a lap around the large parking lot before reaching the main trail. I thought that front loading some distance would give me a psychological edge, making my long miles on the trail seem a little shorter. Unfortunately I miscalculated a little and paid for it at the end. I ran without water because my Amphipod bottle is not usable and my Ultimate Direction bottle had not arrived. I could have run with bottled water but I decided to go without, rather than deal with the need to carry a bottle without a hand grip. I took along a GU gel in case I needed a boost later in my run. I ultimately chose not to take it because I didn't want to consume it without water. My extra distance at the beginning of my run provided the surprise of reaching the 4 mile point earlier than I expected. My milestone for that distance is a point just south of the Southern State overpass near the Linden Street crossing. 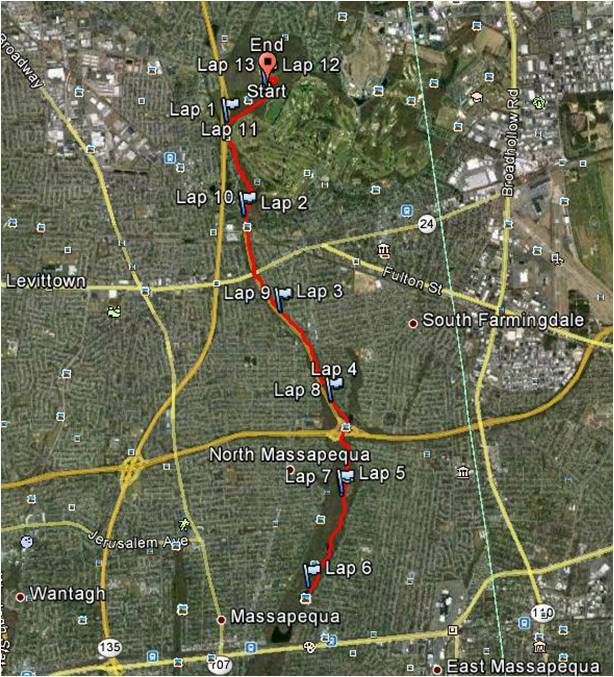 Before long, I was running in the Massapequa Preserve where I planned my turnaround after six miles. That was a mistake. Bethpage is a rolling trail that does a good job of torturing me at certain points in my run. There are some hills to manage during the first few miles, but it isn't until I reach the Southern State overpass where it becomes hard. The section is steep, but not too long, and I get over it fine. The problem is knowing that I'll soon face it coming back, the northbound section being longer, with two difficult inclines. I like the Massapequa Preserve because the path is macadam, not concrete, and everyone on that section of the trail seems to be friendly and smiling. I cruised along well but I did begin to feel fatigue as I approached the six mile mark. I considered having the GU, but I didn't want to deal with the stickiness without water to wash it down. That won't be the case for the Half where I'll run with water or take GU at a water station. Once I cleared the Southern State I tried to feel good that I wouldn't have to deal with big hills for a couple of miles. For some reason I began feeling down and was questioning why I was subjecting myself to this long boring run. I knew even then that much of running is psychological and that I needed to get my head straight if I was to cover the next five miles without going insane. I did recover from that malaise, but my boredom was soon replaced by dread. I was facing the two big hills near the end and wasn't feeling very strong. I again considered taking my gel but decided that I'd almost be finished with my run by the time I felt any effect from it. As I approached the Quaker Meetinghouse Rd. crossing, I seriously considered taking a break. The wooden bench looked tempting but, when I reached it, I just kept going. The first of the two dreaded hills was easier to handle than I'd expected, though I knew I was running pretty slowly. Another runner passed me and disappeared into the distance and I cringed before looking at my Garmin to check my pace. The last big hill was harder than expected, but I knew once I passed it I'd soon be done. In my decision to turn around at six miles, I failed to consider that I'd run about half a mile prior to starting on the bike trail. That meant that, by the time I reached the parking lot, I'd only covered 11.5 miles. In order to reach my 12 mile goal I needed to circle the entire lot. While the parking lot is flat, my mind was set to come off the trail and trot over to my car, stop the Garmin and rest. Instead I had to make that last loop, trudging through final half mile as I wistfully viewed my waiting car. I was beat up pretty badly, but I succeeded in reaching all my training goals for next weekend's race. I will definitely take gels when I fatigue and stop at the water stations or carry my own hydration. Next Sunday will be 1.1 miles more than I covered today. I know it will be hard, but at least the LI Half race course doesn't have Bethpage's hills. That's what I kept telling myself this morning. i was thinking how glad i am not to be doing long runs on the weekend lately! and bethpage bike path is tough on the way back as it's mostly uphill. a hint (which maybe you've heard already) on pacing for longer distance races: run the first few miles about 10s/mi slower than your goal pace. it often yields the elusive negative split on the 2nd half of the race (and pr's). and if you're not having a great day, it can also mean the difference between being happy w/your performance, and disappointed. Hi Carla - It is good advice, especially on races that are 10K and longer. I generally try to make my first race mile the slowest, but it's hard to throttle my pace when everyone around me is sprinting off the line. I'm happy to be done with the Bethpage bike path for now. I'm thinking about returning the following weekend to run on Bethpage's dirt trails for a change of pace.